l-tryptophan is derived from corn dextrose fermentation. It is tested for contaminants, including EBT (peak E) and endotoxin. Niacinamide and pyridoxal 5’phosphate (activated B6) are synthetic. Ascorbyl palmitate is derived from corn dextrose fermentation and palm oil. Hypoallergenic plant fiber is derived from pine cellulose. Not to be taken by pregnant or lactating women. l-Tryptophan can cause gastrointestinal (GI) side effects, including heartburn, belching and flatulence, nausea, vomiting or diarrhea. It has also been related to headache, dry mouth, visual blurring, ataxia, drowsiness and anorexia. Consult your physician for more information. 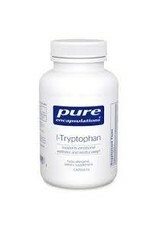 Tryptophan is contra-indicated with serotonergic medications, including SSRI and MAO inhibitor medications. It is also contra-indicated with sedative and antipsychotic medications. Consult your physician for more information. pyridoxal 5’phosphate (activated B6)................................................. 5 mg.
2-6 capsules per day, in divided doses, between meals.